When the King and all the men of the castle die, it's time for the women to knight up. When King Mancastle and his mighty vassals ride off on a crusade, the women left behind are not at all put out-that's a lot less armor polishing to do. Of course, when the men get themselves eaten by a dragon and leave a curse that attracts monsters to the castle . . . well, the women take umbrage with that. Now, Merinor, the blacksmith's wife is King, Princess Aeve is the Captain, and the only remaining (and least capable) knight, Sir Riddick, is tasked with teaching the ladies of the castle how to fight, defend, build, and do all manner of noisy things the men had done while the women assumed they were just drunk. 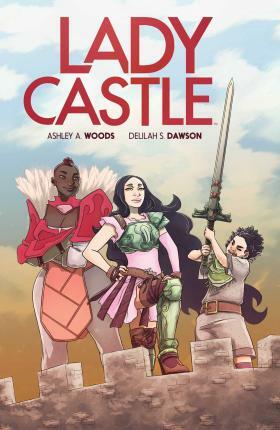 Novelist Delilah S. Dawson (Star Wars: The Perfect Weapon, As Wicked as She Wants) brings her first original series to the graphic novel world, and is joined by breakthrough illustrator Ashley A. Woods (Niobe: She Is Life) for a rollicking fantasy adventure in Ladycastle.